LAS VEGAS (Mar. 29, 2010) – Reigning World Boxing Federation heavyweight title-holder Frans “The White Buffalo” Botha was supposed to fight 4-time world heavyweight champion Evander “The Real Deal” Holyfield 12 years ago but boxing politics eventually destroyed that match-up. 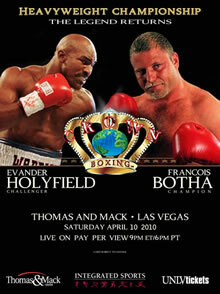 More than a decade later, though, Botha (47-4-3, 28 KOs) will finally get his crack at the living legend and future Hall of Famer when he defends his title belt April 10 against Holyfield in the 12-round main event, headlining “The Legend Returns” pay-per-view event, live at Thomas & Mack Center in Las Vegas. In 1998, Botha was the No. 1 mandatory challenger and Holyfield world champion. Instead of getting his title shot, Botha explained, he was placed in a box-off that he refused to fight in, sending him from No. 1 to No. 11 in the ratings, and Holyfield ended-up fighting Vaughn Bean.